The procedure is done by using a hand tool with ultra fine needles and each ‘hair’ is gently etched into the skin, giving an incredibly natural and realistic look. Microblading can dramatically correct or fully reconstruct lost eyebrow and is excellent for those wanting to enhance their brows or who have little to no eyebrows, thinning brows from age or over tweezed brows. Pigments used are chosen to match the natural or desired brow color and skin tone will also be taken into consideration. Permanent makeup is a form of cosmetic tattooing also known as micro-pigmentation, derma-pigmentation, and permanent cosmetics. Permanent makeup artists use tattooing techniques to apply designed that would resemble makeup. Eyelining, color enhancement of skin on the face, eyelids, lips, and eyebrows are all areas that permanent makeup is traditionally applied to. It results in enhanced facial features that would typically be done with temporary makeup. Permanent makeup is the virtually the same thing as getting a typical tattoo. A permanent makeup artist will use tattoo machines to implant ink into the dermis, just getting shy of how deep a regular tattoo will penetrate. 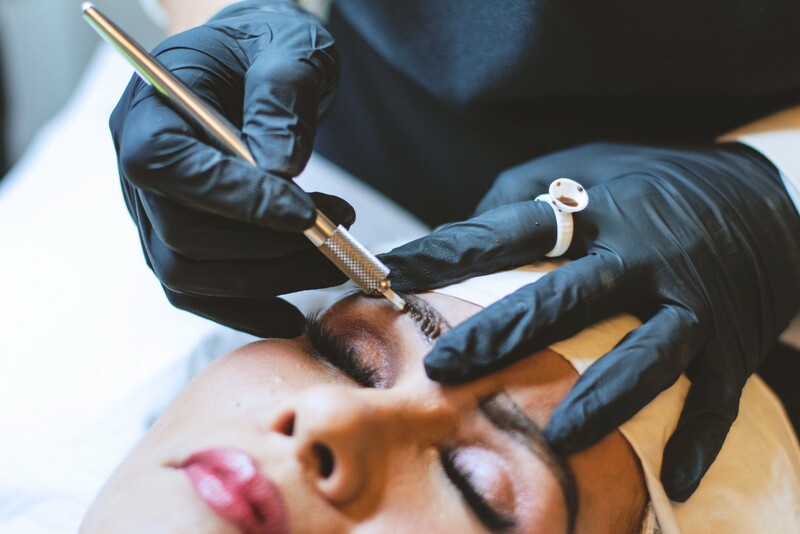 Complications with permanent makeup include allergies to pigments, scars, skin cracking/peeling, infection, blistering, granulomas, and keloids. Many permanent makeup artists use regular tattoo ink which can change color over time and have dangerous minerals like cobalt and mercury in them. 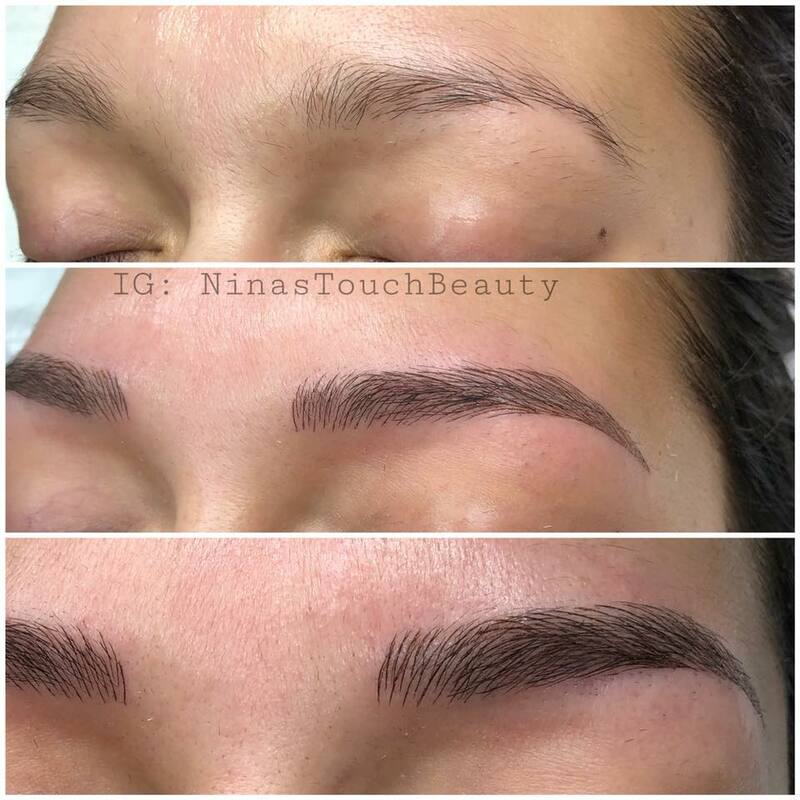 A well informed and experienced permanent makeup artist will always use safe inks and techniques. 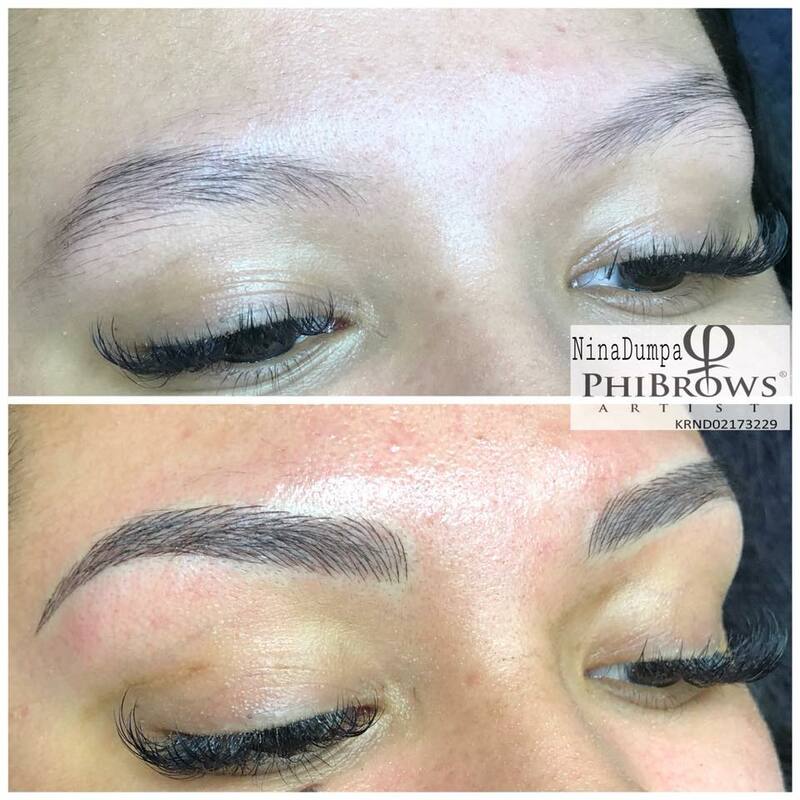 With permanent makeup that involves the brows, usually a powder fill like technique is used to make the brows look denser and fuller. The issue with permanent makeup for brows is its inability to create the natural and full look that microblading successfully achieves. 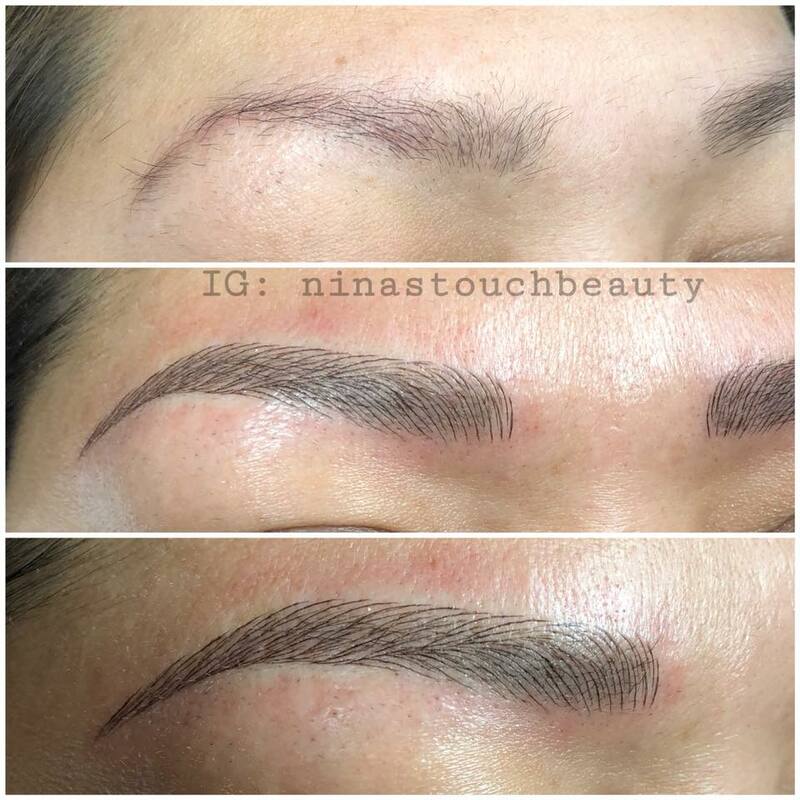 In the worst case scenario, unknowing clients will go to a traditional tattoo artist that will outline brows and fill them with color, making a solid eyebrow look that is very unnatural and usually regrettable. These tattoos are usually much more permanent lasting decades. 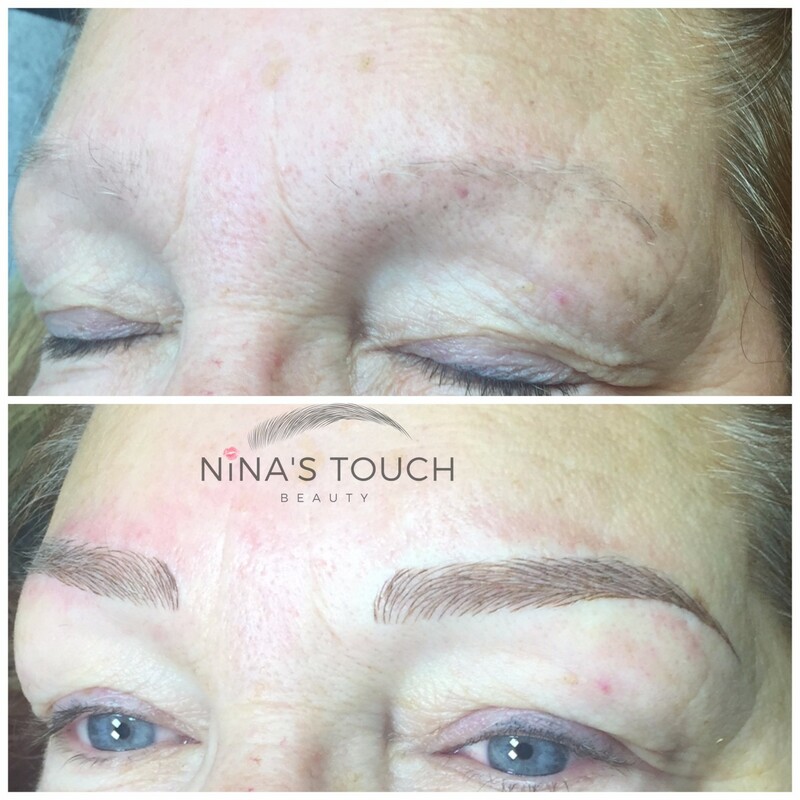 Microblading is a technique performed by manually depositing cosmetic pigment under the top layer of the skin using a microblade. 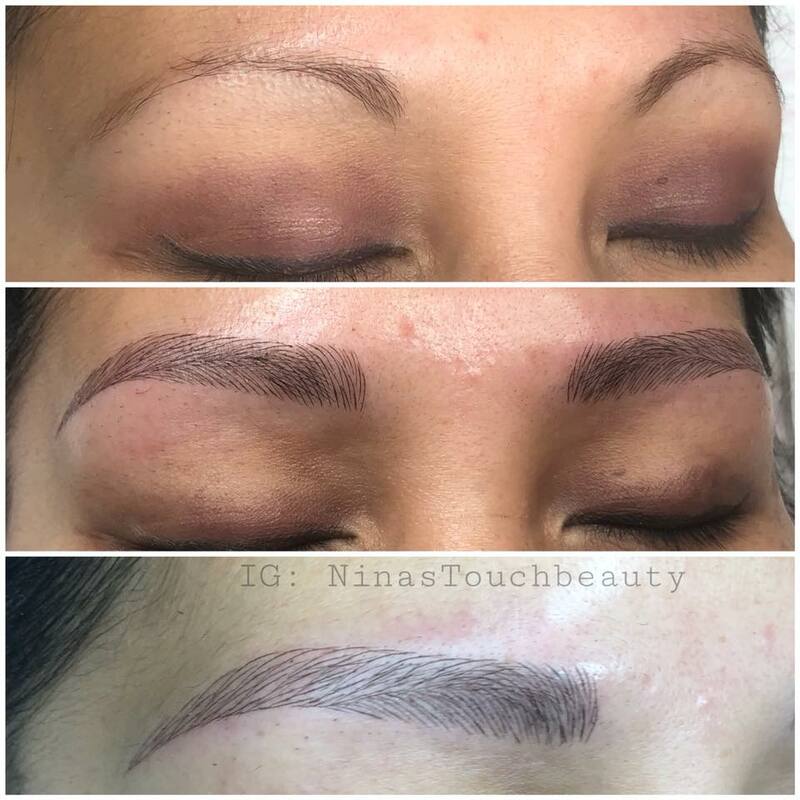 This microblading technique involves drawing individual, crisp hair strokes that create beautiful, natural, subtle looking brows that accurately replicate hair. 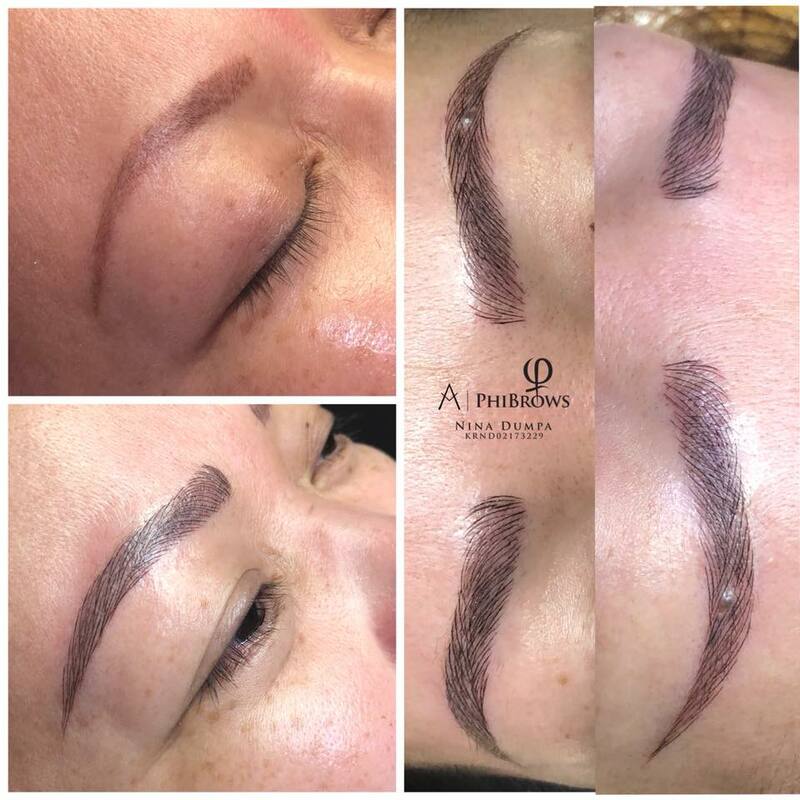 This semi-permanent tattoo method is perfectly suitable if the client wants to correct current eyebrow shape, add volume to brows or fill in sparse areas. It is also suitable for clients with no eyebrow hairs, as I will create new beautiful, naturally looking brows. My goal is to create eyebrows that no one would be able to tell has undergone the semi-permanent treatment. • You have irritation of the skin of any kind such as blemishes, pimples, rash, psoriosis, eczema, rosacea, sunburn on the area of procedure. Results can last anywhere from 6 to 18 months, depending on a variety of factors such as skin type, age, color of pigment and lifestyle and skincare. This varies and is different for everyone because each person has a different pain tolerance. A strong anesthetic gel with 4% Lidocaine and 2% Tetricaine is used to assist in the discomfort. Other factors such as menstrual cycles can also affect the level of sensitivity. Typically the appointment takes 3 hours and most of the time is spent measuring and going over the shape and color before the actual procedure begins. My clients health and safety come first, and that’s why I only use the highest quality and highest standard pigment available. They are 100% vegan, never tested on animals and FREE of heavy metals that are used in most semi-permanent brands. All of the pigments used are cosmetic grade, meaning that they are sterilized and purified for cosmetic use. The pigments used are exclusively made for microblading and allow for an easy application with excellent color retention. All hand tools are single-use, come in a sterilized package, and disposed of after each client. There is no downtime, however the brow will take about 10 days to fully heal. You are able to walk right out the door, ready to show off your new brows. Initially stronger in color your new brows will soften in 2-3 weeks. HOW IS THE MICROBLADING PROCEDURE PERFORMED? The procedure is done using a hand tool, with a prepackaged, sterile, single use “blade” made up of a grouping of needles that are 3x smaller than the needles that would be used in a tattoo machine. With the appropriate amount of pressure, the skin is scored and the pigment is deposited into the epidermis (outermost layer of skin). Think paper-cuts! • Do NOT take Advil or other blood thinners such a Aspirin, Niacin, Vitamin E and/or Ibuprofen unless medically necessary, 48-72 hours prior to your procedure. Extra strength Tylenol can be taken if you have low pain tolerance. • If you have recently tanned this will affect the outcome of the healed color. • If you’ve had laser removal of previous work done by someone else, the treated area has now more scar tissue and can affect the outcome of the result. More treatments may be necessary to have the skin take the color. • Avoid exercising the day of procedure as this will open up the pores. • Immediately following your procedure, the tattooed area will appear to be darker and bolder in color and more sharply defined. Over the next 2 days it will appear even darker and thicker as scabs begin to form. You must let the scabs naturally flake off bit by bit. It will take up to 14 days for scabbing to be over. • You may NOT get the area wet for too long or apply any kind of products (except what I provide for your aftercare) for at least 10 days after. NO makeup on the area for 2 weeks. We choose the shape of your new brows together. Whether you are just looking to enhance the fullness of your natural brow, or create a whole new shape, we will take it one step at a time. Your new shape will be applied with a cosmetic pencil first so that you can see how it will look your face. We will not start the procedure until you are happy with what we have created. WILL MY BROWS LOOK FAKE? No, not with the Brow Building method. Because individual strokes are made to closely mimic natural brow hair, most of the time the results are hardly distinguishable. Yes, because the pigments used in the service are natural, plant based pigments, they are semi-permanent.. But, unlike tattoo ink, they will fade true to color. As your brows fade, they will look soft and natural. And because the pigment is only placed in the outermost layer of skin, the pigment will not bleed outside of the exact place that it was deposited. This means no blurry blue/grey/green/orange brows. Factors such as sun exposure and certain skincare products and services can also speed up the fading process. WHAT IF I DON’T LIKE MY BROWS AFTER THIS PROCEDURE? Keep in mind that your brows will appear darker for the first couple of weeks than they will once they have healed. Once they have healed, we can fix any minor imperfections during your 4 week touch up appointment. There is a removal process, there is no guarantee, but it does generally give great results. As with all cosmetic procedures, individuals should not make their choices lightly. We always recommend clients do their research, understand the procedure and compare different artists’ work and portfolio when making their decisions. Our brow technicians will do their utmost to shape and style the eyebrows to the clients satisfaction prior to the procedure. Every effort will be made to achieve an even appearance, but please realize our faces are never perfectly symmetrical. Uneven appearance can be fixed during the touch up session. Pigment discoloration and color correction can also be fixed during the the touch up session. Microbladed brows will eventually fade away if no additional touch ups are done. CAN I HAVE THIS PROCEDURE DONE IF I HAVE NO BROW HAIR AT ALL? Absolutely, this is a great option for those who suffer from Alopecia, Trichotillomania, or have been through Chemotherapy. Microblading can even correct past wax catastrophe, over tweezing, or the normal hair thinning that occurs post menopause. CAN I HAVE THIS PROCEDURE DONE IF I AM PREGNANT? The average across the US ranges from $450-$850 with some areas reaching as high as $1,200. Our cost is $350 – $499 and this includes the 6 week touch up. If you wait longer than 12 weeks to book your complimentary touch up, our touch up fees will apply. Day 1-7: Read the aftercare instructions carefully. We insist on dry healing. For oily skin, gently blot your eyebrows with tissue every hour for 24H to remove excess sebum. on Day-3 when it gets really itchy, gently apply the ointment (Aquaphor or grapeseed oil) with a cotton swab to relieve itchiness and make sure your hands are washed. Sleeping on your side- pigment will rub off your pillow and usually the brow tail will disappear. If you have any unexpected problems with the healing of the skin, please call your artist immediately to discuss further instructions. Consult a health care practitioner at the first sign of infection or an allergic reaction, and report any diagnosed infection, allergic reaction, or adverse reaction resulting from the artist and to the WA State Health Services, Drugs and Medical Devices Group. 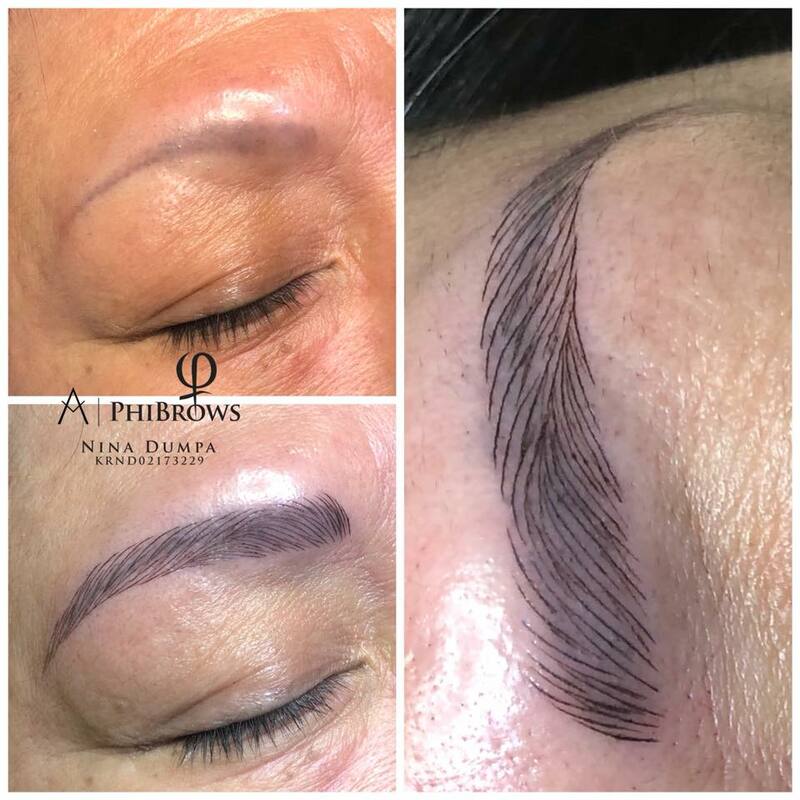 In Asia, this treatment is also known as eyebrow embroidery also known as feather strokes in Europe and allows anyone to improve the appearance of their brows. Using a specially designed blade, we implant pigment underneath the epidermis to create the most natural finish to your eyebrows. This process uses the highest quality colour, methods and service to ensure that you leave with the perfect frame to your face. Before we begin, we will consult with you about what you envision your eyebrows to look like, giving you the freedom to choose whether you would like thick and dark brows or a lighter and finer finish. This cutting edge treatment is used to give realistic hair stroke effects to eyebrows, enabling a thicker and fuller appearance without the need to apply make-up on a daily basis. 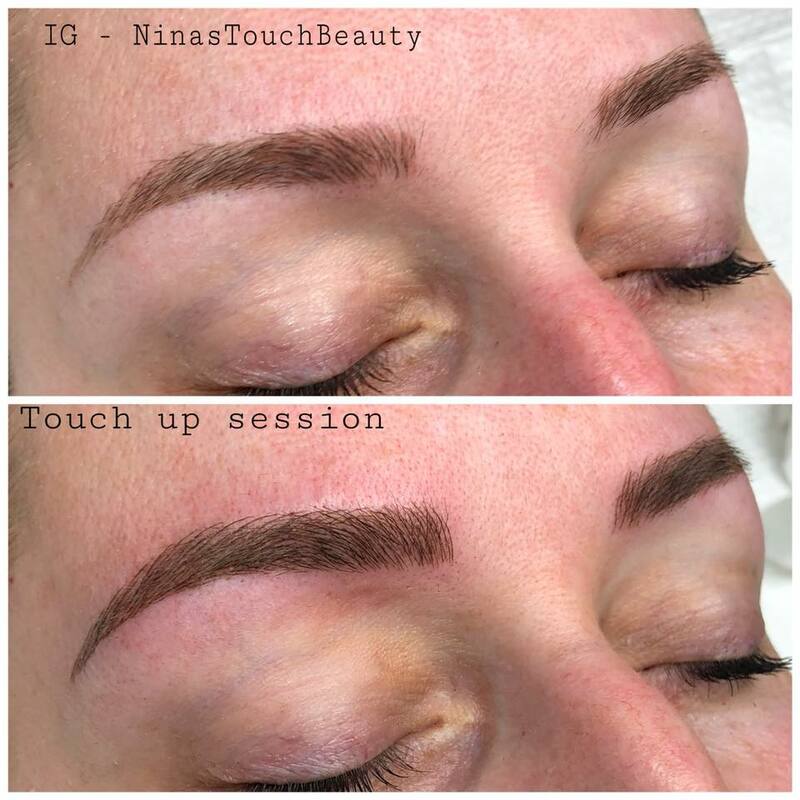 Some of the most common reasons why people turn to microblading are to change the shape of their brows, to improve definition, to add colour and density, as well as to replace brows that have been lost through medical treatment or over plucking. Furthermore, since results can last for up to 24 months, it enables you to experience a high quality finish without the need for much maintenance. The eyebrow area will be slightly red after the procedure and color will appear very dark. This is normal for the procedure and part of the healing process. The color will fade by up to 40% as it heals. In the following days, the eyebrows will continue to be dark and you will notice slight scabbing. Do not pick at the scabs as this may damage the skin and the outcome of the microbladed area. The eyebrows will lighten up in color as it heals. 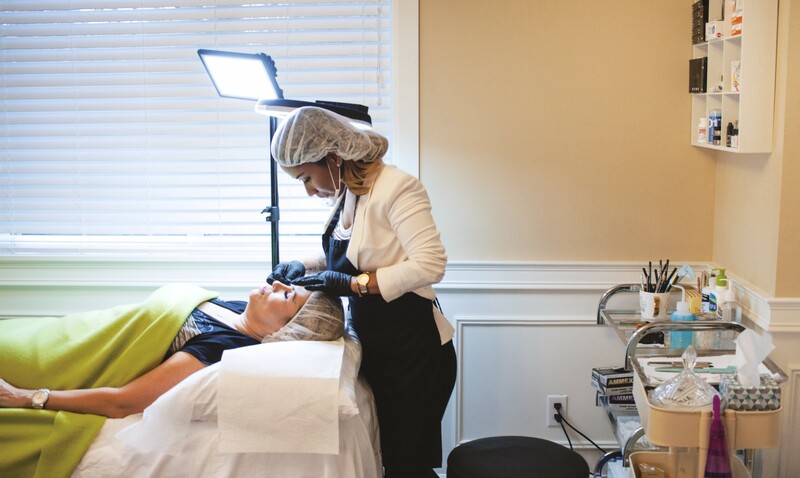 No down time is required after microblading procedure. It takes approximately 7-14 days for the brows to heal over and about 1 month for the color to fully set in. You’ll notice the color is very light right after the two weeks after healing; the skin will have an opaque milky looking quality to it. This is known as the milk skin and is common in tattooing. This is due to the the tissue still healing from the inside out even though the surface of the skin is healed. True color will reveal itself once healed. Since microblading pigments are not implanted into the skin as deep as traditional tattoos, the area will naturally fade overtime. Microblading typically lasts 1-3 years, depending on skin type (normal, oily, dry), age (youthful/mature). Skincare routine will also affect the lasting effect of the pigment: patients who tan, uses products with AHA or Glycolic Acid with fade faster as your skin will resurface faster. Each individual’s color retention within the skin will vary. To maintain the brows looking fresh, a touch up is suggested every 12-18 months. 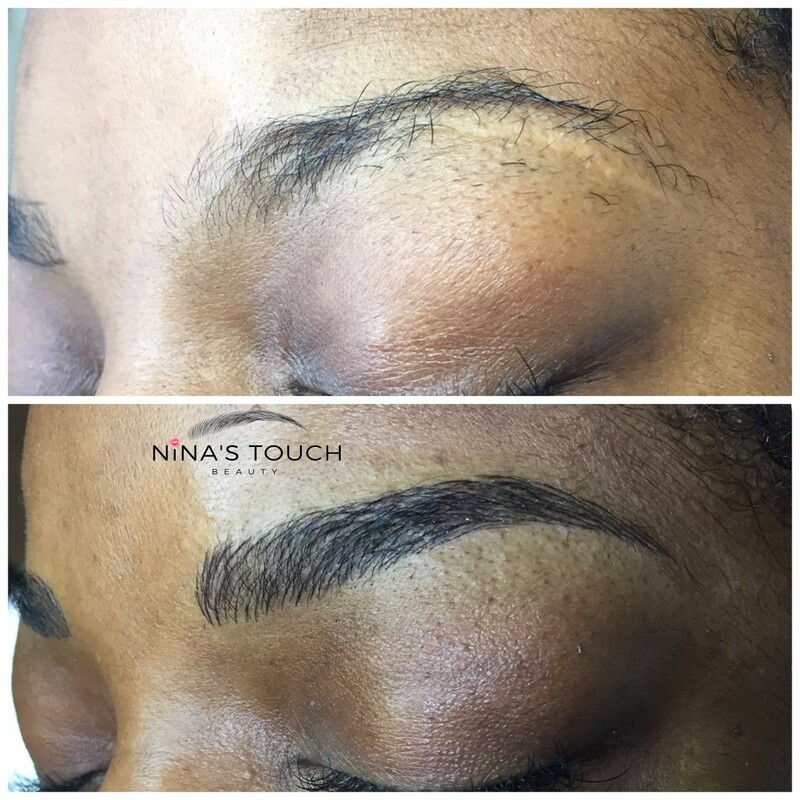 Clients can let the microbladed area fade over time, but please note a slight shadow may remain. - Avoid alcohol and aspirin/ibuprofen and any vitamins that may thin your blood for 72 hours. - Avoid tanning so we can assess your natural skin tone. - No face scrubs or chemical peels at least two weeks prior. - Feel free to come in with their brow makeup on so our technician can see your every day look you prefer. Reference pictures of shapes and colors of brows are always welcomed. We will then work together to create the perfect brows! - Within 2 hours after the procedure, clean brows using a q-tip and lightly moisten with distilled or cooled downed boiling water. Gently wipe away the old healing balm and any lymphatic liquid (clear yellowish liquid) that may have built up. Lightly pat dry with tissue and using a new q-tip, re-apply healing balm to the brows. - Make sure to apply a light layer of healing balm morning and night to brows for at least 5-7 days. - Do not over apply healing balm. - Do not immerse brow area in water for 14 days. When showering, make sure to avoid face area. When cleaning or washing face, make sure to avoid brows and clean around it. - Do not put makeup on the brow area for a minimum of 10 days. Microbladed area is an open wound, using makeup may cause infections. - Avoid alcohol and aspirin/ibuprofen and any vitamins that may thin your blood for 24 hours. - Brow area will feel slightly itchy as it heals and will start to lightly scab over. Do not peel or pick at the scabs as this can affect the outcome and pigmentation. - Do not go swimming, tanning or into saunas for at least 14 days. - No face scrubs or chemical peels at least 2 weeks after. - Anyone who has any serious medical conditions may require a physician’s note. - Pregnant or nursing clients who want to microblade can be done at your own discretion. We suggest discussing with your doctor first. 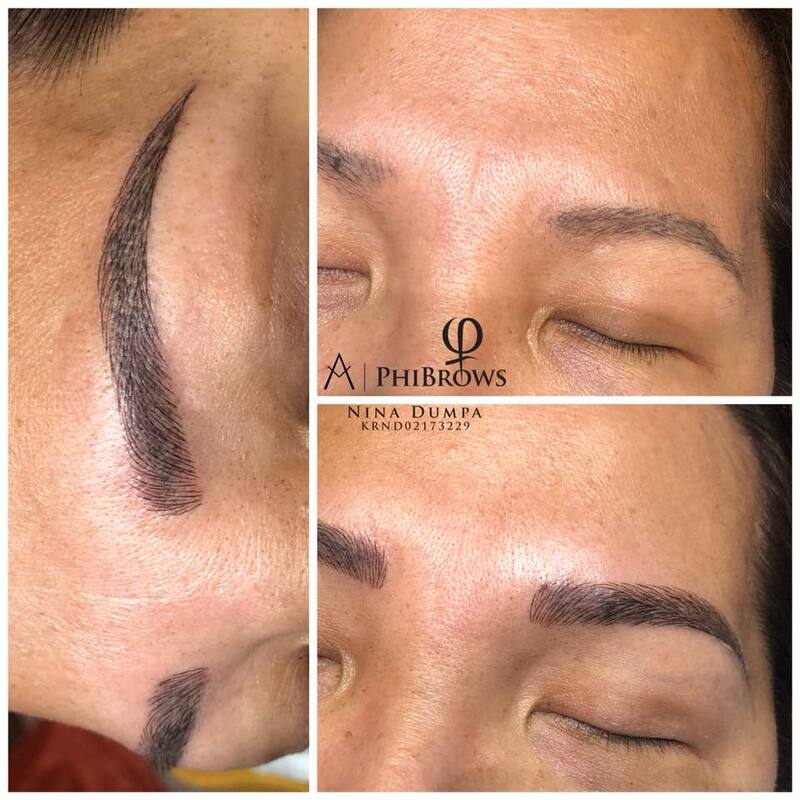 Microblading is still considered a tattoo, and just like with wine or sushi consumption, it is a personal choice to do so during this period. We take all proper precautions for a safe session by using sterilized equipment, new needles and in a sanitized environment. Should clients follow our pre and post care instructions, there should be minimal risks or complications . Although allergic reactions to the pigments are rare, it could be possible for certain individuals. Appointments take considerable time to book and prepare for. Cancelling your appointment for any reason will result in losing the $150 deposit. If you need to reschedule, please notify Nina 72 hours prior to your appointment. If a rescheduling is required within 72 hours a 50% fee will be incurred on all services requested. If you fail to show up to your FREE TOUCHUP APPOINTMENT, or cancel within 72 hours of appointment time, the free touch up appointment will be void. There will be a $150 fee for the touch up and your appointment will be rescheduled at the next available appointment time. Please understand that when you forget, cancel, or change your appointment without giving enough notice, Nina will miss the opportunity to fill that appointment time, and clients on her wait list will miss the opportunity to receive services. The 72 hour cancellation policy gives her time to inform wait list clients of any availability. Nina treats her clients as per the "Golden Rule" and asks her clients to do the same. Thank you! 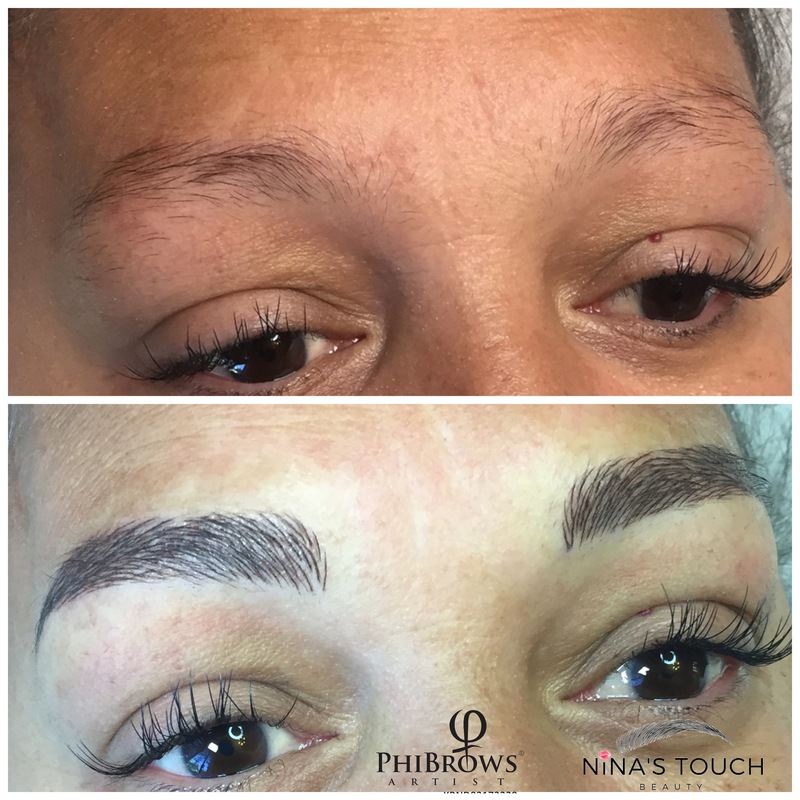 PLEASE NOTE: Nina will no longer be offering a free touch up appointment starting September 1, 2018. Please take advantage of a free touch up and book your appointment before September 1, 2018. Nina understand unforeseen circumstances happen and she will do her best to accommodate you. Being 15 minutes late may result in a forfeit of your deposit and re-scheduling of your appointment. Your remaining balance is due in CASH at your appointment or 3% additional fee if paid with Visa, MasterCard, Discover and American Express. No Checks Please. All sales are subject to RETAIL SALES TAX will be added to the final service cost. A Non-Refundable deposit of $150 + sales tax is required to book all appointments. 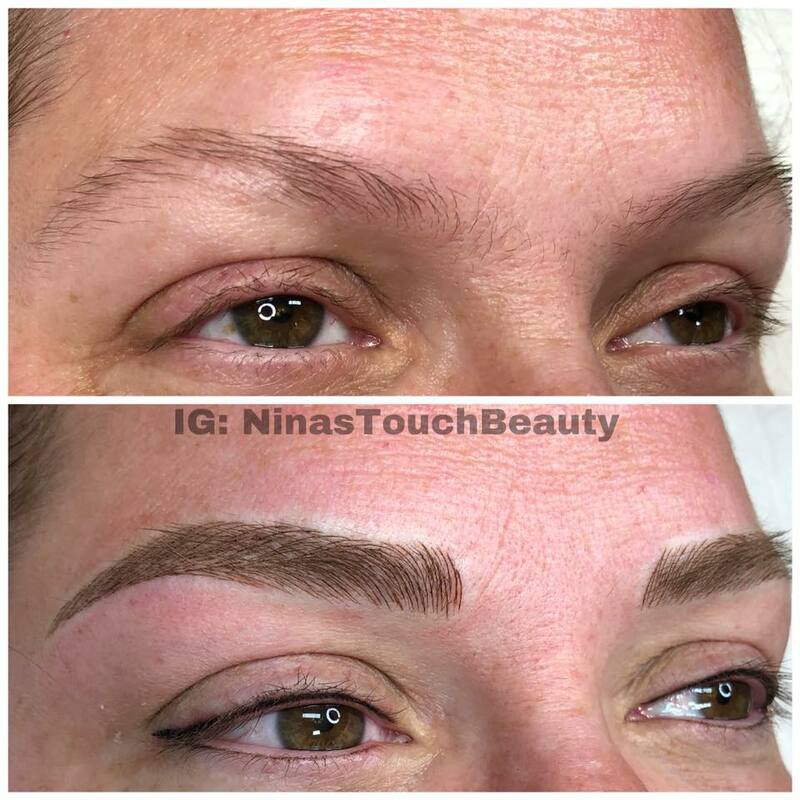 Nina’s Touch Beauty reserves the right to change services prices at any time without notice.